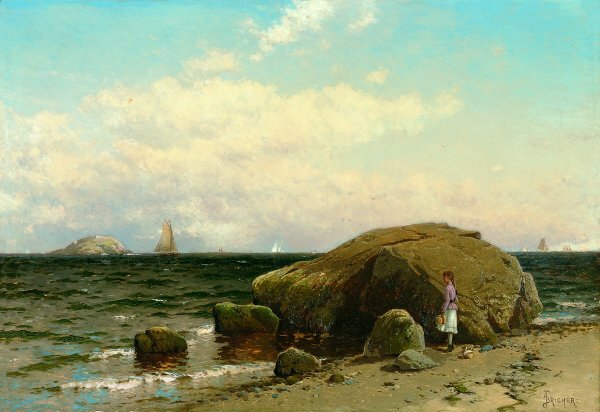 Alfred Thompson Bricher is most closely identified with paintings of the shoreline of Eastern United States and Canada, devoid of human association, in which sea, land and sky are held in a carefully balanced equilibrium. A contemporary writer's description of the Eastern shore captures the essence of these paintings: "The rocks are torn into such varieties of form, and the beaches are so hard and smooth, that all the beauty of wave-motion and the whole gamut of ocean-eloquence are here offered to eye and ear." But in the lengthy essay which appeared in William Cullen Bryant's Picturesque America in 1874, it was also observed that a transformation was occurring along the isolated Northern shore of the United States, as the coast was increasingly being visited by "the rich-man and his family who seek in proximity to the ocean their summer recreation from the cares and excitements of the year." Americans were discovering the amenities of the shoreline. While the less fortunate clustered at beaches near the cities, the wealthy sought out the remote areas of the eastern coast for a reinvigoration of their physical and mental health. After the Civil War artists were recording not only the power of the ocean, but the pleasures that were taking place along the coastline. Bricher carefully recorded this human activity along the shores in his sketchbooks of the 1860s and 1870s and in a number of his paintings of the 1870s and 1880s. Most often the figures were female, not male, as he portrayed women and children enjoying their weekday leisure after the paterfamilias had returned to his work in the city. Fashionably dressed women sit on the sand or rocks of the shore, often protected by parasols, while occasionally children play on the beach. Sometimes the women and children engage in a social conviviality as they partake of the pleasures of the beach, while at other times the women, singly or in pairs, are remote and isolated, as they sit on rocks gazing out to the endless sea before them. We find both the veneration of the ocean and the recreational activities of its shoreline in Bricher's Looking out to Sea. A young girl, hat in hand, looks to the horizon dotted with sailing vessels. A picnic basket lies on the sand behind her, suggesting a sociable occasion, yet her pensive form is dwarfed by the immensity of the rock against which she is silhouetted. The long figure, strangely isolated, adds a piquant note to a composition bathed in the sparkling sunlight of a summer day. The painting hints at the festive pastimes of the shore, as well as implying a fragile relationship between man and nature.